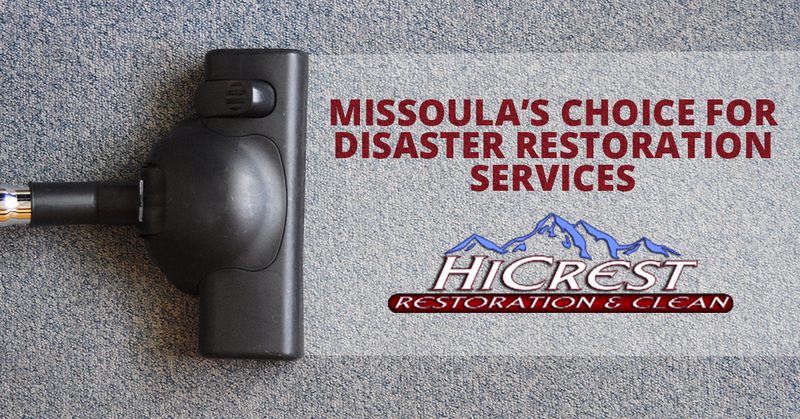 Whether you are seeking emergency restoration services, water damage repair, mold removal and treatment, you have commercial fire damage and are in need of smoke damage restoration, or you need professional carpet cleaning from a local carpet cleaning company, HiCrest Restoration & Clean is Missoula’s top choice for these services and more. In today’s inaugural post, we would like to take a moment and tell our readers a little bit more about our restoration company. Keep reading if you are interested in learning what sets us apart among other commercial and house restoration companies. For starters, we are fairly certain you won’t find another business that identifies as a sewage cleanup company, a water damage company, a home restoration company, a mold removal company, a fire restoration contractor, and a professional carpet cleaning company all at the same time. Our variety of services certainly sets us apart, and we will describe each in greater detail below. But, while we are discussing it, we want our readers to know that just because we have a diversity of services at HiCrest Restoration & Clean, it does not follow that we are stretched too thin. We are experts in the following fields. We are also local to Missoula, and are excited to offer our restoration services to the community which we are a part of here in Montana. If you are looking for residential restoration services, HiCrest Restoration & Clean is at your service. As locals of Missoula ourselves, we understand that storm damage can be severe and your house restoration company needs to be quick and efficient in response. We provide emergency restoration services on homes, but even if there isn’t an immediate need, we can come out to your location and help you assess the damage. Whether the culprit is lighting, heavy snow, hail holes, flood messes, or heavy rain leaks, we can help you out with affordable home restoration services. We don’t limit our scope to just residential disaster restoration services – we are a commercial restoration company as well. If you have a commercial property that is in need of restoration, we can help you out. We are fully licensed, insured, and certified restoration professionals who can make sure that your property recovers its beauty as well as its safety and health. We can walk you through that process, break down your best options, and expedite your business property’s recovery. Whether you are seeking help with your commercial, industrial, or residential property, we can help you out with expert Missoula water damage clean up. Standing water from burst pipes is no fun, and having a rapid response time to solve it is vital to recovering the integrity of your structure. If you are looking for help with a sewage or flood cleanup project, we can help you there as well. Give us a call to talk to Missoula’s choice for storm damage services and in a sewage cleanup company! Looking for fire restoration contractors in Missoula? You’ve found the smoke odor removal and fire cleanup experts here at HiCrest Restoration & Clean. Fire damage can be some of the most catastrophic occurrences that you have to deal with as a business or home owner. Although we aren’t able to recover priceless heirlooms and family photos, we can handle the fire cleanup with skill and speed. We have fully certified and trained fire damage restoration professionals who can make sure your property is restored as soon as possible. Black mold is bad. Black mold in your house is worse. And not knowing who to call for mold cleanup might be the worst of all. Well, actually, all things considered, it’s the easiest problem to solve of the three, given the fact that you are now reading this blog. The thing about mold mitigation is that rapid response is essential, as mold can be extremely hazardous to your health. Our ability to perform mould tests (or is it spelled “mold”? We don’t know, we know how to test and treat for it, though) and provide mold treatment is second to none in Missoula. We understand what measures must be taken if there is a mold problem, and we can recommend the best options that will keep you safe without making you break the bank in order to so. Get your home treated by professional carpet cleaners at HiCrest Restoration & Clean, where we offer industrial carpet cleaning, commercial carpet cleaning, and carpet cleaning services for your home. We are certified pet odor specialists, equipped with modern cleaning technology and equipment. We even offer carpet repairing services, and our experts have been trained to deep clean even the worst stains out there. Give us a call if you are looking for the Missoula carpet cleaners of choice! Although we mentioned it briefly earlier, we have an emergency response team that is always available. Any time of the day or night, we will be there to provide you with expert expert restoration services in and around Missoula. We are fully certified, well-trained, and operate with a spirit of professionalism and excellence in every job, big or small. Sewage cleanup is not something you can mess around with. It needs to be handled quickly and correctly by a sewage cleanup company worth their salt. Why? If it isn’t obvious by the sheer smell of such a problem, the prospect of serious health concerns for anyone near your affected property should be motivation to get the job done correctly. Let the fully licensed, insured, and certified sewage cleanup professionals show you how it’s done by providing you with an experienced recommendation. At HiCrest Restoration & Clean, we work hard to restore your home to its pre-damage condition as quickly as possible. With a comprehensive lineup of disaster restoration services that include smoke and fire damage, true carpet cleaning, mold removal, and flood damage repair, it’s easy to see why we are fast becoming known as Missoula’s best restoration company. All of our team members here at HiCrest Restoration & Cleaning are 100 percent certified, and are committed to keeping your commercial and residential property clean and healthy. Take a look at what Justin Austin, a patron of HiCrest Restoration & Cleaning, had to say about his experience working with our home restoration company. Thank you, Justin, for taking the time to tell others about the quality of our work. We appreciate your kind words! If you happen to be interested in seeing the HiCrest difference (rather than just hearing us tell you about it), check out our gallery page right here. Get in touch with us today if you are interested in special deals for first time visits! We are available 24/7, and would love to earn your business. Let us help you out and prove our worth as dependable in your time of need.